I'm not a very crafty person. Okay, everyone says that about themselves to fish for compliments, but this is how I really feel, so get over it. I should say, I used to be a crafty person, until I lost confidence in my crafting abilities. I'm not really sure how I internalized this belief about myself, as I flex my creative muscles almost yearly for Halloween (here and here are some examples). As you can see, self-efficacy isn't among my frequently-used self-management tools. Although I walked into this wedding-planning process with the best of intentions, I ended up relinquishing control of a lot of things I otherwise would have "DIY-ed." I remember working on many other things myself, feeling a tinge of sadness but then thinking it was ridiculous that I'd be sad about assembling such a small number of things for the size of our wedding. 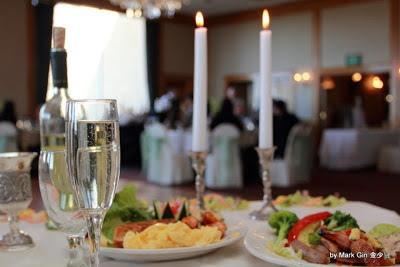 Here are some of the details of our ceremony/reception (all-in-one), in case anyone needs ideas. And as always, feel free to contact me anytime. I shopped with one person, my closest female friend. She volunteered for this, so I figured it'd be best to take her, otherwise, I didn't feel comfortable asking people who may not have wished to go. 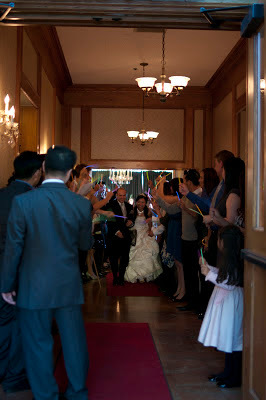 The original intent was to rent because I didn't want to store the dress afterward, but fate had a different outcome. This dress came off the clearance rack at Alfred Angelo (after shopping at a couple of other places, trying on around 10 dresses). I had not been checking that rack, since those are usually filled with dresses that don't fit or are too revealing. My friend insisted I try on a dress from there that was, like, two sizes smaller than I know myself to be... and it somehow fit. This dress was under $300, and for that, I owe her a limb. Cheaper than any (decent) rental I could have found. I wanted to buy a veil from here, but it cost more than half the cost of the dress, which seemed wrong to me. I decided to rent from my engagement photographer/make-up artist, along with jewelry because I didn't already have "nice enough" stuff. This actually was quite the cost-saver. Also, I altered my dress at a dry cleaners -- I trusted her because she did my sister's bridal gown and our bridesmaids dresses for her wedding three years ago. 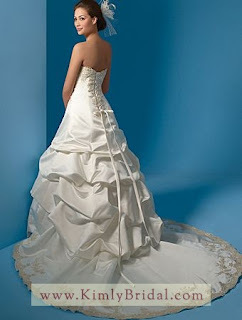 The seamstress needed to shorten the dress (which was not straight-forward due to intricate edging on the bottom), attach a back-panel, close off an area in the back, and create a bustle. She also pressed it, for a total of $80. As for the shoes (which really didn't appear in photos anyway! ), they came from Off Broadway shoes, an outlet of sorts that "The Ukrainian" likes to stop by all the time because it's near his parents' house. They were about $35 and fit the bill because this wasn't something I really cared about and just wanted to be comfortable (and be able to re-use them for non-bridal purposes!). I'm not going to say a lot about the tux, as we just went to Men's Wearhouse and were in-and-out in like 20 minutes. "The Ukrainian" already had a nice pair of special-occasion Italian shoes that he got for around $80 a number of years ago. Oh, men. I really wanted to DIY this, but this involved importing unknown pieces of young bamboo from Taiwan with no samples to go on, so I bailed. Plus, I didn't want to worry about keeping all of them alive in the months-long heat-wave we had here and then bringing them to the destination on the "day of" when we already didn't exactly have that much help. 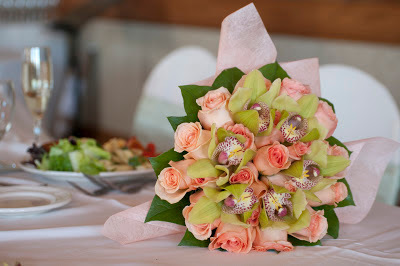 These arrangements came from here. I felt insecure about not seeing an exact sample of what it'd look like, but since I wasn't "set" on something exact, I just trusted them. 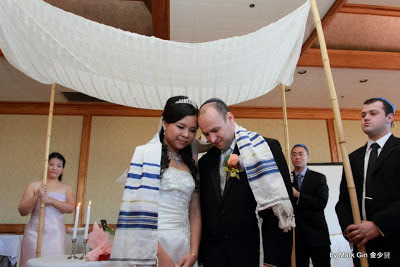 I always envisioned that we would have a Jewish-style wedding, and part of the reason for that is because I wanted to build a "chuppah," a canopy that symbolizes a couples first "home" together. 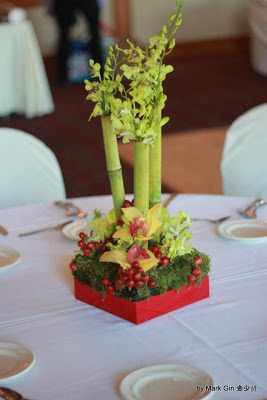 Given my Asian-American heritage, and my long-time love of the color green, and bamboo's strength + versatile uses, we decided to make bamboo the unofficial theme of the wedding. Unfortunately, big bamboo stalks are NOT green, but ehhh, close enough. I liked their rustic look. We found a bamboo wholesale in Orange County and went down there one morning to pick up six poles about 2" in diameter and about 8 feet tall (less than $20). We had a major snafu in constructing this... as it was supposed to be free-standing... All's well that ends well, though! We also had the option of borrowing one from a synagogue, but it was a fun project and meaningful because we had to work together on it. 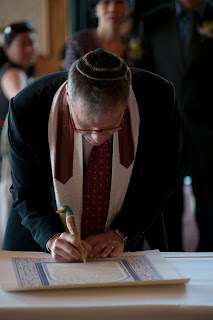 Along the Jewish-style wedding thread, we had a "ketubah," which is basically a marriage contract. Although traditional texts vary in terms of how they, um, frame women, we went with some generic egalitarian text and had our names transliterated into Hebrew. We purchased ours at Gallery Judaica, and it came with a free breaking glass (which we got in green but it never left the pouch!). The artist had to customize ours and send it over shortly before the wedding date. 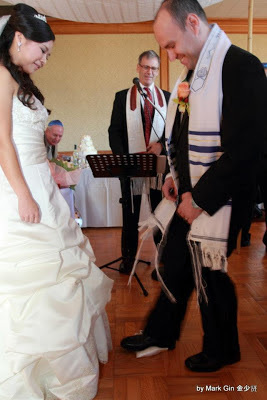 We also picked up a "kippah," also known as a "yarmulke," and a tallit (prayer cloth used during the ceremony). 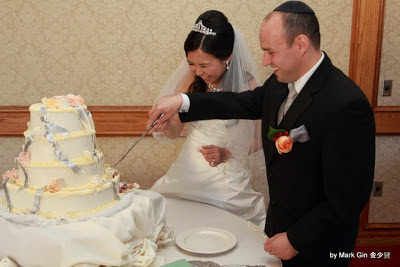 The store was pretty neat and located near my alma mater, which I didn't even know... but then again, I did not foresee myself marrying a Jewish person back then, so hmm. Going along with the bamboo theme, we decided (or I decided, LOL) to hand out fortune cookies as favors. I am kind of an anti-clutter person, so I didn't want to contribute to people's junk piles. Edible favors = no junk. We ordered these from fancyfortunecookies.com in green apple + white chocolate flavor with our names and wedding date inside, plus a message thanking our guests for sharing in our special day. I also got some green organza bags from eBay (for super cheap), though I overestimated the size and really struggled fitting the cookies inside (see below, they are around the centerpiece). 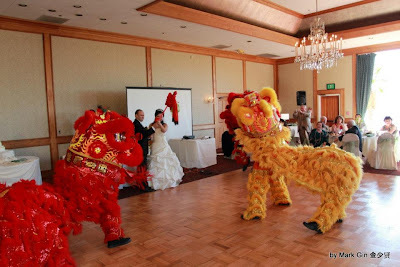 We had a lion dance troupe, recommended by a friend, come in for some expensive 15 minutes, lol. They are really the best in the area, jumping up and over each other, etc., and their purpose was to bring us good luck. 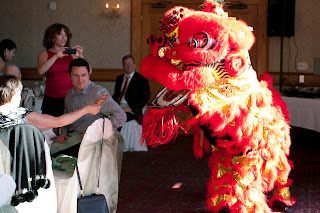 Guests got to interact by "feeding" red envelopes to the lions. Since we did a Jewish ceremony, it was fitting to have this is our main entertainment. Since we overspent on engagement photography, I took a friend up on an offer he made long before I was engaged to take photos at the wedding as his gift to me. While it took bringing another friend and some assurance that they didn't need to be "perfect," I think this was a win-win (they get to build their portfolio, and we didn't have to look for another photographer). One thing I made SURE to do was send a table with the rough program and desired shots for each part. 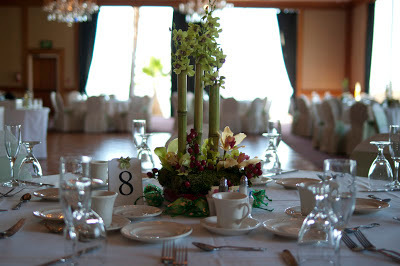 We also met up at the venue a few months before to give them an idea of space, lighting, etc. Invitations are things that I never understood too well... do people even keep those? Given the small guest list, we decided to just buy a kit from Amazon and print them ourselves. Well, turns out that it was a little more complicated than hoped, so I did enlist $10 to have Kinko's do it for me, but in the end, the whole she-bang was less than a dollar per invitation. I had clear address labels already from the past, so those got used. We also decided to forego "Save the Dates" in lieu of just calling and/or telling people the date in person. The name tags were also an Amazon purchase, and this time, the printing was fairly straightforward. The Table Numbers came pre-printed from Michael's craft store for about $6... I had other ideas for this, but this was the most straightforward and aesthetically fitting option. I went back to my engagement photographer's make-up artist to do my get-up for the wedding day. 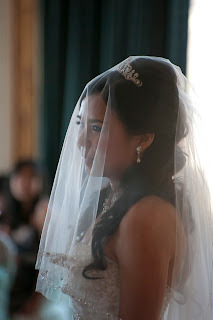 This turned out to be a money-saver because rental of jewelry, veil, and accessories were included. I didn't want to have to buy all these things (see note in #1 about clutter). As for nails, well, I know most brides get a mani/pedi, but since I've never gotten one, I was terrified to start. Nail salons have always given me the "heebies," and the fear of cuticle-cutting and infection and people touching my feet = nooooo. Plus, my mom has always told me how nice my nails are and that I shouldn't let people cut/push my cuticles. So, with my first bottle of $8 OPI (Newlywed shade, or something like that), I painted my own nails two days before the wedding. Who the eff looks that closely, anyway?! 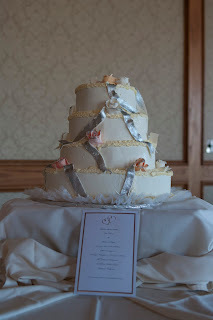 "The Ukrainian"'s mother wanted to have a larger role in the planning than she did, but we really wanted to do our own thing, so we compromised with the cake. I'm glad we did, as Russian cakes taste better than I have experienced in the past. This is a cranberry-flavored "jaconda" cake from a bakery in West Hollywood... totally not-too-sweet, and pretty! So there it is... in a super-long nutshell. Since we were uncertain about all the hooplah in the first place, I am ELATED to be done with this process and money-drain. Although I wasn't feeling very confident that "enough" was put into this, we were praised for our hands-on efforts and thoughtfulness when it came to representing both of our cultures in the event. Again overall, I was very satisfied with how it came out, and I will remember it forever. You putt 1,000 times more effort in your wedding than I did for mine. Congrats! It looks like it was beautiful! Okay, for being ambivalent about the whole thing you sure put together a lovely wedding. Love the mixture of cultural and religious elements. We tried to do that, but I felt it was Mexican (and Catholic) heavy. There were a lot of touches of things that interested him (but not necessarily Jamaican/black), so I hope it balanced out. The lion dancers look awesome. Talk about cross cultural! What a lovely ceremony!